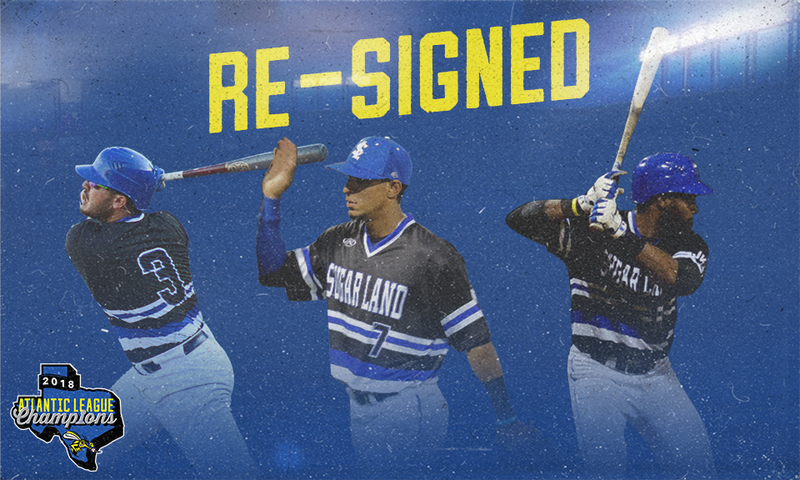 SUGAR LAND, TX— The Sugar Land Skeeters today announced their first three player signings of the 2019 season in catcher/infielder Albert Cordero, infielder Alvaro Rondon and outfielder Tony Thomas. All three players appeared for the Skeeters in 2018 and were on the postseason roster when they won the 2018 Atlantic League Championship. Cordero, who turned 29 on Monday, is set to appear in his fourth straight season with the Skeeters. He set professional career highs in 2018 with 12 home runs and 63 RBIs, while appearing at catcher, third base, second base and first base, and was selected to the 2018 Atlantic League All-Star Game. The native of Caracas, Venezuela, is fourth all time in games played (277), fourth in doubles (52), tied for fourth in hits (264) and tied for sixth in RBIs (112) in Skeeters history. He was also named the Skeeters Community Man of the Year in 2017. Cordero first appeared at the professional level in 2008 within the New York Mets Minor League system and has reached as high as Double-A at the affiliated level. He has a career slash line of .253/.299/.355 with 45 home runs and 300 RBIs in 807 career games at the professional level. Rondon, 28, is slated to appear in his second season with the Skeeters and his sixth as a professional. Rondon played in a team-high 109 games at shortstop last season and was named the Skeeters’ 2018 Community Man of the Year. The native of Santiago, Dominican Republic, was third in the Atlantic League in 2018 with 38 stolen bases, which were also the third-most in a single season in Skeeters history. Over his last three seasons, all spent at the Independent level, Rondon has stolen a combined 118 bases in 294 games. Rondon, who played collegiately at Texas A&M International, first appeared at the professional level in 2014 within the Minor League system of the Arizona Diamondbacks, reaching as high as Triple-A. Thomas, 32, played in six games for the Skeeters in the 2018 regular season after spending a bulk of the year with the Wichita Wingnuts of the American Association. But the former Florida State standout played an integral role in the postseason, including a walk-off grand slam in Game 5 of the Freedom Division Championship Series against the Lancaster Barnstormers on Sept. 23, sending the Skeeters to the Atlantic League Championship Series. Thomas’ 11 RBIs in the 2018 playoffs were the most in a single postseason in Skeeters history. The Chicago Cubs selected Thomas in the third round of 2007 MLB Draft. Along with the Cubs, he’s spent time in the Minor League systems of the Boston Red Sox, Philadelphia Phillies, Detroit Tigers and Chicago White Sox, reaching as high as Triple-A. Including his time at the Independent level, Thomas has a career slash line of .256/.321/.435 to go with 148 home runs and 656 RBIs while appearing in 1,301 game as a professional. The Skeeters open the 2019 season on April 25 at Constellation Field against the Southern Maryland Blue Crabs. Season tickets for the 2019 season are currently available and individual tickets will soon be made available. To purchase season tickets, or for more information on ticketing, visit sugarlandskeeters.com or call the TDECU Ticket Office at 281-240-4487.